Well, it's all feeling rather 2010 around here. Nvidia has transported me back to when we couldn't figure out which shower of self-serving idiots to form our government so we just left them to figure it out, a time when Chilean miners starred in their own low-res reality TV show, and a time when we finally found out how destructive a weapon the vuvuzela could be. Why am I feeling so nostalgic? Because Nvidia has decided to release a new graphics card that' channeling the spirit of one of the worst releases of its last few generations. When I look at the new GTX 660 Ti, all I can see is the frankly offensive spectre of the GTX 465 looming over it. That was a card housing a pared-to-the-bone version of the then top GPU, offering limited performance for almost the same price as the far superior GTX 470. Two years later and the same can be said of the GTX 660 Ti and impressive GTX 670. That's a shame, as I've been waiting for the mainstream-oriented GTX 660 Ti to hit the shelves since I first saw the Kepler architecture way back in March this year. Nvidia brought the top-end GTX 680 out first, aiming squarely at AMD's top GPUs, and to start with it had the edge. As time has moved on though, the AMD Graphics Core Next architecture - exemplified by the surprisingly excellent HD 7970 GHz Edition - has proven to be a tough nut to crack. 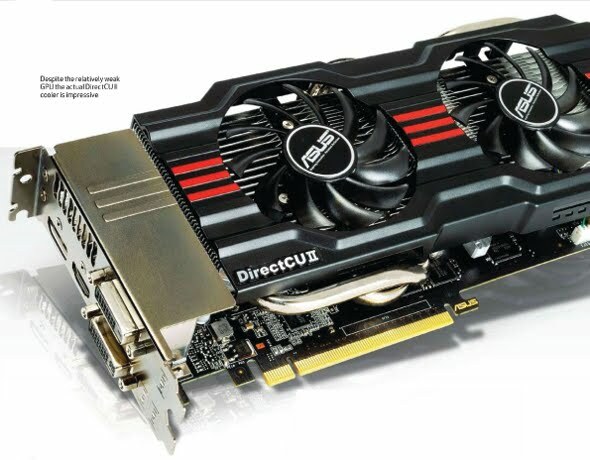 As the AMD driver sets have matured and more Compute-focused game engines have emerged, such as those powering DiRT Showdown and Sniper Elite, the Radeon cards have taken the ball and ran with it. Nvidia was hoping to fight back with the GTX 660 Ti, and in the volume end of the market that's where you want your graphics cards to take the crown. That's where the bulk of the graphics card upgrade money is spent, and it's the segment that can make or break a GPU generation. This Asus GTX 660 Ti DirectCU II Top is the Taiwanese company's heavy overclocking card and, as such has come to market with seriously tweaked clocks, a bespoke PCB and cooling solution, and a chunky price premium on top. So what makes up this new mainstream GPU, then? Well, it's the same Kepler GPU that has made up the bulk of Nvidia' 600 series cards. Therefore, it's the GK104 chip, the same as in the GTX 690, GTX 680 and GTX 670. In fact, it's an almost identical chip to that in the most recent Kepler card, the GTX 670, but with a few key parts turned off or turned down. It's still rocking seven of those SMX modules, so comes with a total of 1,344 CUDA cores, all now running at the same speed as the base clock. It also has the same 112 texture units, but crucially is missing eight ROPs for a reduced total of 24. The GK104 GPU in the GTX 660 Ti is kept company by the same 2,048MB GDDR5 video memory, running at a breakneck 6,008MHz, though the bus betwixt chip and VRAM is a rather reduced 192-bit affair. Compared with the 256-bit bus used by the rest of the Kepler top-table GPUs, that's a little weak. The close connection between the chips in the GTX 670 and this GTX 660 Ti explains why there's only $80 difference between the $402 RRP for this latest card and the $482 you can pay for a reference GTX 670. In the grand scheme of things though, that $80 makes all the difference. When you're talking about the overclocked SKUs of the GTX 660 Ti, like this Asus Top edition, then we start to hit a price parity with the GTX 670 the new Nvidia card can't hope to replicate in terms of gaming frame rates. To be fair though, Asus's impressive cooling solution meant it could really push the clockspeed of the Nvidia GPU. The base clock for a standard GTX 660 Ti is 915MHz and Asus has upped this to 1,059MHz. In practice, however, that translates to a general boost clock, in game, of around 1,215MHz. Sadly, even that heavy overclock up to the frame rates that you'd expect from a $482 graphics card. And that's the real problem with this GPU. So, what of those frame rates? How does the card Nvidia says will bring next-gen tech to a ton of gamers actually perform? It performs exactly as your might expect to chopped-up GPU to - not very well. This Top edition has all the advantages of Asus's overclocking nous, but even that can't push this sliced-up GPU towards the performance of its immediate competition. And that competition is intense. On the Nvidia side you've got the GTX 670 at the same price as this Asus card, on the AMD side there's the HD 7950 at around $418. "PUT IT UP AGAINST THE CHEAPER 7950 AND THINGS LOOK GRIM"
which still considerably cheaper than even the reference GTX 660 Ti at $402. Let's give Nvidia the benefit of the doubt for a second though and look as its 'new' GPU against the HD 7870. Yes, it's an overall win, with the bulk of titles favoring the green side, but the more compute-focused games like DiRT Showdown and Sniper Elite favor the GCN Pitcairn core in the HD 7870. Put it up against the HD 7950 though, and things look grim. Even against this seriously over-stretched version of the GTX 660 Ti, the cheaper card has the edge. Only in Shogun 2 can the Nvidia card claim a win - in everything else the HD 7950 is all you need. It also has the performance chops to really work a high-res monitor. It's downright embarrassing when the GTX 660 Ti faces up to its own big brother, the GTX 670. As we've said, the Asus Top edition is the same price as a stock GTX 670 at $482 and is a long way off it in terms of gaming frame rates. The synthetic Heaven benchmark is generally a good yardstick of overall graphical power and at this the top-end GTX 660 Ti comes up woefully short. You know, sometimes it can be really fun writing a negative review of a product, but occasionally a product is so disappointing there's not an ounce of enjoyment to be had from hoofing it like a lame beggar. We'd expected the GTX 660 Ti to be a serious contender for our favorite GPU of all time. After all, when you combine the goodness of the Kepler architecture (GPU boost, impressive power juggling, and pretties like TXAA and Adaptive Vsync) with a mainstream price tag, how could it fail? Well, talk to Nvidia and you'll find out. It can certainly fail if you don't bother designing a GPU aimed at the mainstream and instead just hack up the existing chip you've been using for your top-tier gaming cards since March. "NVIDIA NEEDS TO STEP OUTSIDE AND SMELL THE GLOBAL RECESSION"
been pared to the bone. Hacked up, as it is in the GTX 660 Ti, it's not much good to anyone unless it's significantly cheaper than we're seeing at launch. At $321 this overclocked Asus Top edition would be a great graphics card, but when it costs the same as the far superior GTX 670, it's completely irrelevant. Even the EVGA GTX 660 Ti SC with its $402 tag is too expensive, losing out to the slightly faster HD 7950 at the same price. It's not like this is a new precedent either. I'm referring again to the familiar situation that arose when Nvidia was getting into the mainstream segment of its first generation Fermi cards. After the GTX 470 came the GTX 465. It was using the same GF100 GPU Nvidia was putting in its top-end cards, but with a lot of the chip's innate goodness cut out. Nvidia also positioned it only slightly cheaper than the much faster GTX 470. It was roundly panned as a pointless release and was superseded in around a month by the fantastic GTX 670 and its new GF104 GPU. We can only hope the same thing happen here and we'll see a new Kepler GPU, specifically designed for the mainstream segment, in a GTX 660 without the Ti moniker - and for a more mainstream price. Seriously, when did $402-$482 become the mainstream pricing for graphics cards? After a run of really very good graphics cards, Nvidia needs to step outside and smell the global recession. Bring me my real mainstream Kepler card, not this pretender to the throne.